Our bodies have no off button for sugar as it is not traditionally used or programmed to deal with such a refined source of carbohydrates. As it is such a pure source of glucose or fructose its consumption over time affects our health. Excess consumption of sugar is linked to obesity so if you would like to lose weight cut down on your sugar consumption, however, fruit sugars are fine. Sugar consumption is linked to inflammation in the body. If you have any persistent pain in your body or would like to decrease your risk of a heart attack, diabetes, gout, or arthritis then cut added sugar from your diet. Acne has been closely linked to excessive sugar consumption, so it might be beneficial to cut sugar from your diet and see if it helps clear your acne up. Get yourself tested for gluten and dairy allergies as well. 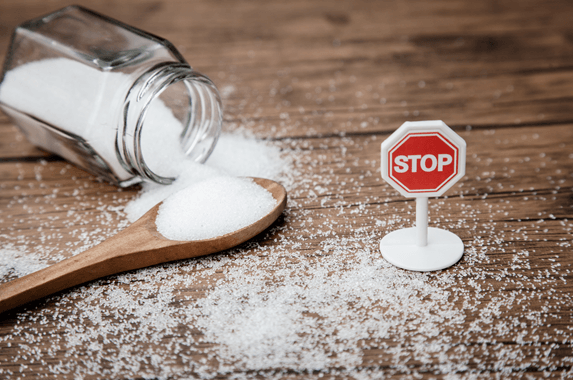 If you have diabetes in your family or have been told by your doctor that your developing diabetes, cut out sugar from your diet and see if this helps. Sugar is linked to developing an acidic body and as a result inflammation. Its consumption can also be linked to different forms of cancer. You can reduce your risk of dementia by cutting sugar out of your diet. Sugar also ages your skin so if you would like to maintain skin health cut out sugar. In additional to limiting your sugar intake, herbal body wraps, mud wraps, magnesium baths and using mineral salts to exfoliate your skin also helps maintain healthy skin. Sugar consumption also ages your body because it affects the health of your DNA. Sugar and coffee consumption can lead to an energy spike followed by a crash in your levels requiring you to need more sugar for balance. Sugar consumption also leads to fatty liver and kidney disease which affects your health in many ways. Sugar consumption is also linked to tooth decay leading to costly dental bills. If you want to improve your health, then decrease your sugar consumption. It can take time to lose your sweet tooth but given time your body will adapt to it. The process of adapting to cutting sugar out of your diet can take up to a month, but the results are well worth it. Nothing is more precious than a body which is healthy and full of vitality, so make the change today. Helping you realise your birthright. To have great health.